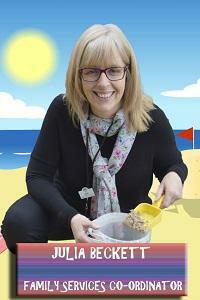 My name is Julia and I've been working here at Epsom Children's Centre for around 4 years. You might have met me at one of the Stay & Play sessions - generally somewhere I can enjoy messy play! I've been an Outreach Worker for several years before starting in this role. Nowadays I'm involved with organising our training courses & creche team, our 'Chatter Matters' group (Speech & Language support), working in the community promoting the centre activities, breastfeeding and parenting support. I've learnt first hand how challenging parenting can be with real ups and downs, we all need a bit of help at times - supporting families to find ways to manage their children's behaviour is really important to me, sometimes the smallest changes can have the biggest effect. In my opinion Epsom & Ewell is a great place to live and work. Everyday I can see a real sense of community growing as families discover all the benefits of linking up with the Children's Centres.